Nicolai Adam's India U-17 World Cup squad were handed a reality check by Russia U-18 team in the Valentin Granatkin Memorial Cup played at St. Petersburg, Russia on Sunday night (January 8, 016). The first goal came as early as the 2nd minute when Glushkov headed in the first corner of the match. It wasn’t the start which the Indians were looking for. The second goal came off another corner in the 12th minute – this time Goalkeeper Dheeraj Singh fumbling to collect it and it was gleefully tapped in by Denisov. Glushenkov made it 3-0 in the 21t minute. He followed up a long ball played behind the defence, beat his marker for speed and lobbed it over Dheeraj. Rudenko made it 4-0 in the 25th minute and Gluskenov scored his second in the 31st to make it 5-0. Following a cross from the left, he trapped in between the two defenders and made space with a deft feint to blast it in. Russia scored the sixth goal immediately after the changeover when Tsypchenko tapped it in after dribbling past Boris Singh. It was 7-0 in the 67th minute - this time Tsypchenko heading in a corner. With nine substitutions being allowed in the match, Coach Nicolai Adam brought in as many as six substitutions but they failed to make any impact. Late in the second half, India did have a shy at the rival goal but first, Sanjeev’s shot sailed wide and then Komal’s shot went straight to the rival Goalkeeper. Latchevic completed the rout in added time when he made no mistake to slot in from the penalty spot. 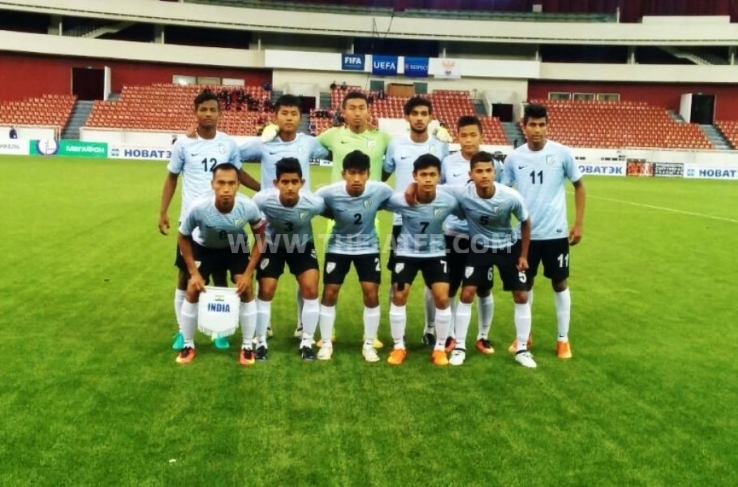 India next play Belarus U-18 Team on Tuesday (January 10).